Prunus padus L., Padus racemosa (Lam.) Gilib., P. asiatica Kom. This species can be a tree that grows 2-5(10) m tall or a tall shrub with black-gray stems and branches. Young shoots are reddish brown with whitish yellow lenticels. Leaves are 4-12 cm long and 2-6 cm wide, varying from ovate-lanceolate and elliptical to obovate, sharp, with wedge-shaped or rounded base, leathery, glandular-acutiserrate along the edge. The upper side is wrinkled, dull, dark green, while the underside is slightly glaucous, bare or downy, without punctate glandules. Petioles are 1-2 cm long with or without large glandules at the base of the blade. 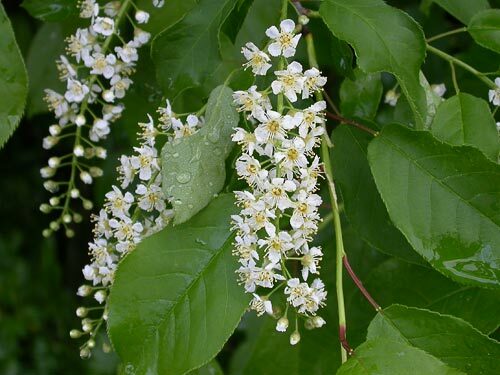 Flowers are fragrant, gathered into long, drooping racemes 5-12 cm long, set on bare or pubescent pedicels. Sepals are sharp or rounded, glandular along the edge. Hypanthia are saucer-shaped. Corollas are white, 1-2 cm in diameter. Fruits, 5-7 mm in diameter, are spherical, black and edible. Seeds are egg-shaped, grooved. This species is entomophilous. It is an ornito- and zoochore. It is propagated by seeds, layers and root cuttings. Seeds should be stored for 6-7 months at 3-5╓C. Blossoms in April-June; fruits ripen in July-September. Chromosome number: 2n=32. Distributed throughout almost all territories of Russia (except for the Northeast and the Arctic Region), the Caucasus, Europe, Middle Asia (spurs of Obshchy Syrt, Turgai Plateau, Mugodzhar Highlands, Ulytau Mountains, Kazakh small hills, Tarbagatai, Dzungarian Ala Tau, Trans-Ili Ridge, etc. ), Asia Minor, Mongolia, China, and Japan. This species is a mesophyte. It is relatively shade-tolerant. It is gas-resistant. It grows predominantly in the forest zone, penetrating along river valleys into the steppe zone, and, in the north, it reaches the northern verge of the forest-tundra. Most frequently occurs in flood-plains, along brooks, in valley meadows, along forest edges and less frequently under the canopy of thinned forests. Sometimes forms extensive thickets. It ascends the mountains up to the middle mountain-forest zone. This plant is used as a food (fruit), honey production, industrial and ornamental. For a long time this plant was successfully utilized in landscape architecture; it is well-adapted to pruning. In recent years, breeders have started using it as an initial source of variation in the development of valuable forms and hybrids with large fruits and better flavor. This species is promising for hybridization with cherries.